In Africa the honeyguide and the honey badger are partners: The honeyguide finds the honeycomb and the honey badger cracks it open with its strong claws. They share the sweetness, and that is the way it has always been. But this day, greedy Badger gulps down all the honey! Honeyguide is not happy. As the news spreads from animal to animal, Honeyguide hatches a plan. The next day she leads Badger off on a rollicking chase, but this time Badger is in for a not-so-sweet surprise! Fans of The Mitten and The Umbrella will delight in these two original characters as they race across the stunning Okavango Delta filled with exotic animals. 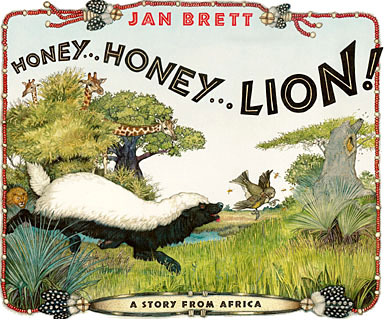 Jan Brett and her husband, Joe, have visited Botswana three times. Their guide, Ali Tiego, told them the true story of the honeyguide, and then the legend--if you don't share the honey, the next time the honeyguide will lead you to a lion! Ali taught us that large cats could be hiding anywhere, especially under the candle pod acacia. Jan says. "In Tswana, the language of Botswana, this shrub is called 'the house of the lion.'" How does the news travel without any telephones? "It's a bush telegraph," we were told. Ali is always listening to the sounds. The yelp of a jackal or a guinea hen's cackle spells out a whole story--if you know how to listen.